This Poster Frame is LED Illuminated! Each Unit Holds a 27" x 41" Movie Poster! 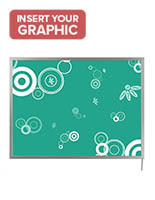 Poster Frames are Offered in Many Other Sizes as well. 18" x 24" 22" x 28" 22" x 56" 24" x 36"
8mm acrylic, light guided panel diffuses with great power. 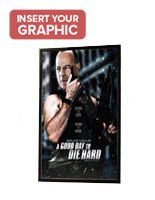 27" x 41" frame is designed to hold movie posters. 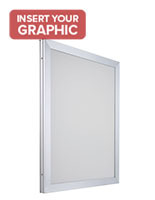 This poster frame for daily use combines the power of LED illumination technology with the elegance of a thin profile. 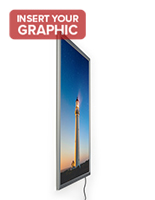 The frame on each model is .88" thick, making it one of the slimmest marketing devices currently available. Small LED bulbs in the sides of the poster frame prevent against "hot" and "cold" spots appearing on the graphics. The diffusion patter within the lightbox makes sure that the beams shed evenly over the images. Customers see every aspect of the visual. 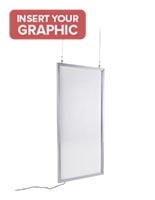 Each poster frame that glows evenly comes with the necessary hardware for ceiling attachment. The hardware includes: (2) 60" length monofilament lines, (4) "S" hooks, (2) ceiling hanger clips & (2) toggle bolts. 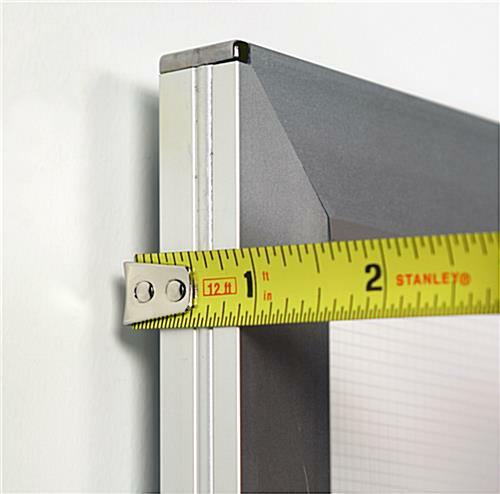 Durable, polycarbonate brackets are included for linking the lines to the lightbox. These brackets attach through channels in the back of the display. 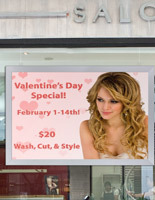 This poster frame that suspends from ceilings is a great choice when it is necessary to quickly changing signs. The snap enclosure on each side of this poster frame requires little effort to use. 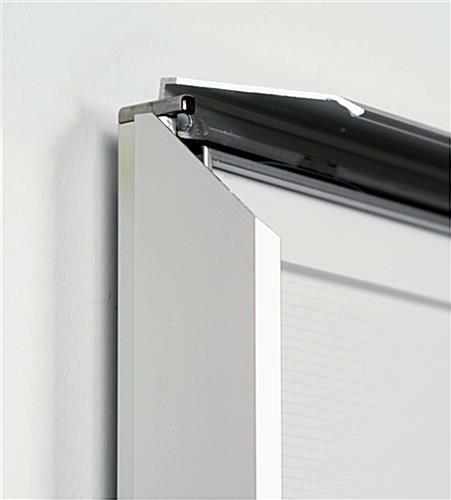 Flat hinges within the border make for fast action opening and closing. Users can also adorn this LED signage to the wall. The thin poster frame showcases images and graphics in either landscape or portrait orientation. Corners on each display are rounded. 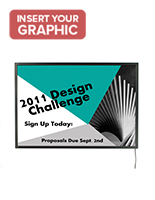 This poster frame that promotes does have a higher price tag than conventional backlit lightboxes on the market, but that money is earned back quickly over time. The small energy efficient LED bulbs in this LED signage are actually smaller and more efficient than the traditional fluorescent lighting devices. These lights will save money on electricity bills in comparison to backlit designs! The small fixtures are rated for use 24 hours per day, 7 days per week. This display can go for 100,000 hours, which means users will not need to replace parts for over 11 years. 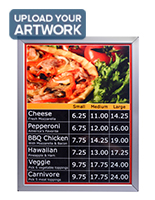 The lifespan is so long that 24 hour establishments, such as convenience stores and transportation stations, are the perfect candidates for these lightboxes. 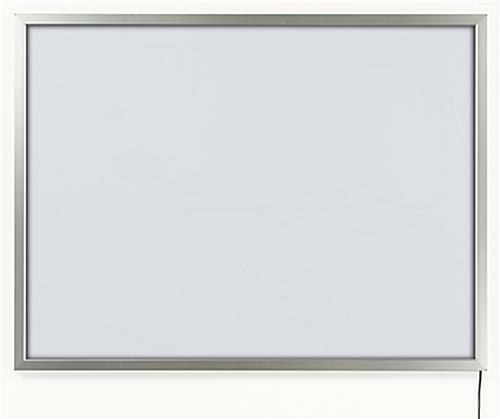 The 27" x 41" dimensions of this holder are perfectly suited to hold standard sized cinema posters. 27.8" x 41.8" x 0.875"